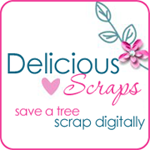 Delicious Scraps: New PTU Mini Kit "AppleLicious" and FREE Add-On!! New PTU Mini Kit "AppleLicious" and FREE Add-On!! There is also an alpha that is available for purchase separately - one alpha already comes with the kit. Here is the Add-On that is free for a limited time only!! so SWEET! thank you for sharing!! :) Have a TERRIFIC day! Thank you so much for this Freebie. I want to let you know that I posted a link to your blog in Creative Busy Hands Scrapbook Freebies Search List, under the Page 4 post on Sep. 17, 2009. Thanks again. Thank you for sharing your wonderful work. I am a paper scrapper at heart, but falling for digi scrapping by the minute. I have dl a few of your fabulous freebies in hopes of learning this "new to me" craft and perfecting my skills.